Sketch the electric field lines in the vicinity of the charged insulator in Figure 18.50 noting its nonuniform charge distribution. 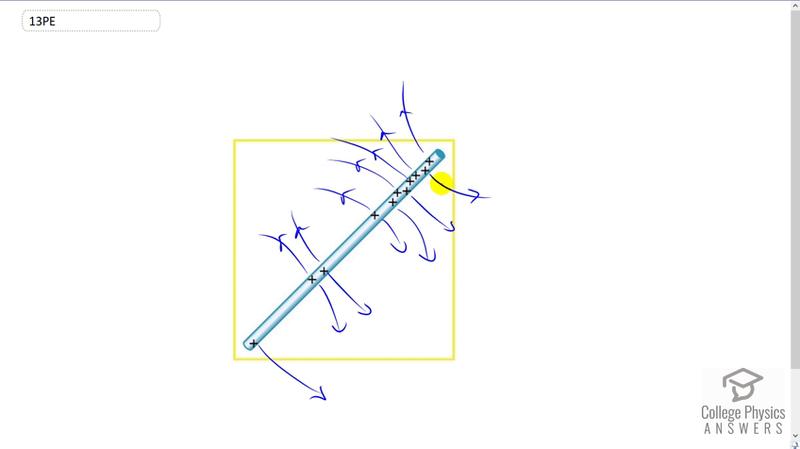 See solution video for drawing of electric field lines. This is College Physics Answers with Shaun Dychko. A positive charge emits in an electric field that is directed away from the positive charge. So we’re going to be drawing arrows pointing out from each of these charges. And it has field lines in all directions. So this charge here has a field line pointing down and up as well. And the field lines near the ends are going to curve away, so this field line from this charge on this end here is going to curve away from the field lines that are beside it because these charges are tending to repel this one on the end. And the ones in the middle are going to be fairly straight though because they are being repelled equally from both sides. So in fact maybe this one here should be a little straighter. And this one’s going to be straight because other charges are quite far from it and so it won’t affect its curve at all. And these will be curving away from each other, maybe this one can curve away a little bit more although not too much because of all these charges here, and these ones are curving downward. There we go.